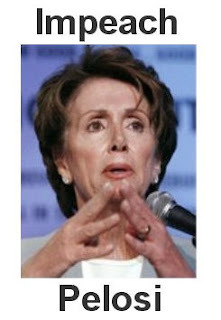 Impeach Nancy Pelosi is not related to the excerpted article or its source. It is growing statement of opposition on FaceBook. We know it is not really possible to"impeach" Nancy Pelosi but she has Impeached herself. Join Us for fun, conversation and a way to learn about actions you can take to help other face the fact that Pelosi should not be Speaker of the House. Well, well, well...it would seem that Nancy Pelosi has outed herself as a liar...a disingenuous, political opportunist, hell-bent on making sure that her ideology is placed above the importance of honesty and good government. It is stunning that the White House and the Democrat leadership haven't counseled her to limit her media liability. With each session at the podium, Pelosi either changes her story, creates another firestorm or both. Had she been a Republican her resignation would have already been filed. . . .
Now that Nancy Pelosi has demonstrated that she is willing to lie – bald-faced and in a grotesque manner – to achieve her goals, how can Democrats in the US House of Representatives allow her to remain as Speaker of the House? Every single word that comes out of her mouth from this point on must and will be questioned. Now, I have always questioned Ms. Pelosi's actions, but I have done so because I believe she simply isn't smart. I believe her to be intellectually stunted and an ideological pawn for the neo-Marxist movement that has been making incremental inroads into our society ever since the 1920s. I can understand why she was elected to office. You only have to look at the electorate of San Francisco and their icons, the faculty at Berkeley, to understand why...they're straight from the Frankfurt School of Marxist ideology. But how people like Steny Hoyer (D-MD), Jim Clyburn (D-SC), John Larson (D-CT), Jan Schakowski (D-IL) and Maxine Waters (D-CA) allowed this intellectual midget to ascend to the speakership...well, I suppose it stands as testimony to the intellect of the Democrat leadership. Tags: Family Security Matters, Impeachment, Nancy Pelosi To share or post to your site, click on "Post Link". Please mention / link to the ARRA News Service. Thanks!